The traditional Mapuche communities and authorities wish to express our consternation regarding the imminent expulsion of the Mapuche Ambassador by the Swiss authorities. 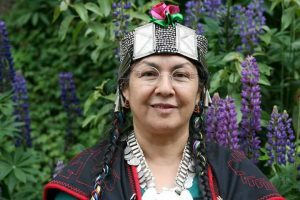 Flor Calfunao Paillalef, Apo Werken and Ambassador to the United Nations, is one of the people chosen by us to represent us through the Mapuche Permanent Mission in Geneva, Switzerland – she has until August 16th to leave the country. The traditional Mapuche authorities chose Flor as leader of the Permanent Mission on September 20th, 2011. We deeply deplore the attitude of the current Swiss government in wanting to obstruct the operation of our mission and deprive us of our voice at the United Nations. While in Chile and Argentina the police repression against our people has intensified it seems grotesquely unfair that Switzerland adds to this oppressive campaign by persecuting a representative of our people – a defender of the human and cultural rights of our nation. Flor and her team have given us a voice in the international community, something of which indigenous peoples are often deprived, and the facility to represent ourselves with the legitimacy and dignity that we deserve. The Swiss government’s decision to expel Flor Calfunao Paillalef only confirms the historic disregard that Switzerland has for the human rights of indigenous peoples, because through their actions they back up the racist and genocidal politics implemented by the present government of Chile. Following the conclusion of the military occupation of our territory by the Chilean state in 1883, thousands of Swiss families – invited by the Chilean government – sought economic refuge in our territory. They knew then, as many of their descendants still recall, that they were induced to colonise a territory that did not belong to Chile – a territory that already had owners and came under the jurisdiction of a nation that up until then had been sovereign, independent and free; whose territory was protected by border treaties under international law. It seems ridiculous that the current Swiss government blocks a Mapuche woman, A SINGLE MAPUCHE WOMAN, from settling in their territory. It is also shameful that an economically prosperous country denies asylum to a member of our people when in the past their own state helped to destroy ours for its own benefit. The concept of justice and historical reparation appears not to exist in the Swiss dictionary – especially considering that this may be the first time in history that a member our people has sought asylum there. Today many Swiss, settled in Mapuche territory for more than a century, remember the damage inflicted on the Mapuche people to the point that some of them have volunteered to sell their lands to the Chilean state in order to return them to the legitimate owners – unfortunately the Swiss government has failed to emulate this high moral example. For their part the Chilean government, under Sebastian Piñera, refuses to assign funds for the purchase of land for this purpose, instead allocating large amounts of money to the procurement of arms and to train police personnel to be used in its repressive campaign against the Mapuche and the militarization of their territory. Our diplomatic team at the UN have provided the Swiss government with all the evidence necessary to justify Flor’s application for asylum. Numerous times, under dictatorships and democracy, the Juan Paillalef community has found itself under siege for defending its territorial rights. Police forces under the mandate of businesses and wealthy land owners have violently oppressed the community – despite cases of which being widely documented the Chilean authorities have denied them protection or justice, and so the community has been forced to apply to the Inter-American Commission on Human Rights for precautionary measures for their protection. These measures have not been respected by Chile and the case is currently being looked into by the Inter-American Court of Human Rights. The just demands of the Mapuche people are met with repression and militarisation, to intimidate those communities that assert their legitimate rights. Chile sends paramilitary troops to Colombia and the US to be trained and then used to suppress the Mapuche. Their ideology doesn’t differ much from that of the Nazis – first they single out an ethnic group, then they stigmatize them and then they persecute them. To this end they employ specially designed legislation; they apply anti-terror laws solely against the Mapuche, while the press publish racist and xenophobic material with impunity to whip up hatred and encourage discrimination against our people. At this moment the Machi (shaman) Celestino Cordoba’s life hangs in the balance on hunger strike in order that his right to practice his religion be respected; unjustly imprisoned, framed and condemned with no proof beyond mere presumption of guilt. We wish to collectively reaffirm, together with our brothers and sisters in Puelmapu, our commitment to re-establish our autonomy and self-determination, the right to which is recognised under international law and established by the UN Declaration on the Rights of Indigenous Peoples. Considering that the Mapuche had their own independent state, we have the inalienable right to exercise our peaceful defence, at international forums such as the UN, against those countries that illegally exert their jurisdiction in our territory. Finally we want to warn the Swiss government that, if they expel our ambassador, they too will have to withdraw their consulate in Temuco. We have yet to be informed or consulted regarding the establishment of such an institution in our territory. We call on the whole Mapuche community, to Mapuche groups and organisations and non-Mapuche groups expressing solidarity with the Mapuche across the whole of Wallmapu, Chile/Argentina and beyond, to encourage cohesive and coordinated, peaceful action in order to block the expulsion of our ambassador and secure the freedom of Machi Celestino Cordoba and all the Mapuche political prisoners locked up by the oppressive states of Chile and Argentina. Chilean Military Police assassinate Mapuche Father on way back home from work.